Major Siberian cities. History and attractions of big cities of Siberia. Siberia industrial potential. Siberia industrial potential. History and attractions of big cities of Siberia. Irkutsk was founded as a wooden fort in 1661 on the right bank of the Angara, declared a city in 1686 and nominated the center of Irkutsk province in 1764. The city keeps its historic memory since then: Irkutsk wooden architecture with its ornate, hand-carved decorations, is the trade mark of the city. Irkutsk lies between the East and the West, in proximity of lake Baikal, one of Russia's natural wonders. It makes the city a popular travel destination for tourists from all over the world. Siberian art traditions come from Irkutsk as Siberian art school was founded there. It is one of Siberia's research centers, the city of youth and students, which hosts 23 higher education institutions and branches providing education to over 1000 thousand students. Despite the cold climate it is a very sporty city, a centre of women's bandy in Russia, hosting Bandy World Championships for women 2012. Industry plays an important role in the city development. Irkutsk holds the second place in Russia in terms of heat production and the third place in electric power generation. 60 large and medium-sized industrial enterprises operate in mineral mining, gas and water production, processing industry, manufacturing of electronic and electric equipment, commutation equipment, vehicles, metallurgical and rock-mining equipment. Famous Russian Sukhoi Su-30 family of aircrafts is built by Irkutsk Aviation Association. Barnaul was founded as a in the 18th century after the discovery of rich copper and silver deposits in the Altai Mountain. In 1739 a Russian industrialist Akinfiy Demidov built the copper and silver-melting plant there. The city grew around the factory and became Russia’s major center of silver and copper mining until 1893. Today one can learn about this period in Altay regional museum, located in a former mining laboratory. Like many other Siberian cities Barnaul grew into a major center of trade and culture after the construction of the Turkestan-Siberia Railway in the beginning of the 20th century. It housed relocated Soviet industrial facilities during WWII. Modern Barnaul is an important industrial center of Western Siberia. Diesel and carbon processing are the major industries. 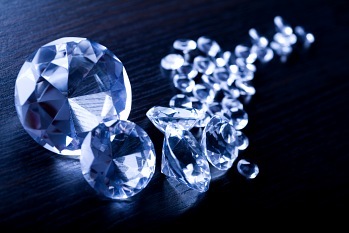 It is one of the only locations in Russia which has an industry specializing in diamond-faceting. Apart from its industrial importance Barnaul is a big transportation juncture too with major highways that connect it to other cities and two branches of the West-Siberian railway crossing the city. The distinctive feature of Barnaul is its architecture. It was built after Saint Petersburg. Classicism style here interweaves with baroque, changing with Stalin’s Empire style. Barnaul is a scientific and research center. It is where Russia’s oldest planetarium was built in 1950. Among other sights of Barnaul is the House under the spire, Nagorny Park and Yuri Detochkin museum - a Russian cinema character who steals cars from crooks in a Robin Hood like way. Kemerovo was founded in the beginning of the 20th century as the rich coal deposits had been discovered there. The local village around the coal mines grew into the city, which became the Kemerovo oblast capital in 1943. It was highly industrialized city with chemical and manufacturing industries during the Soviet times. Apart from its industrial potential part of which in decline, Kemerovo can offer a number of things to the visitor. The city is surrounded by beautiful forest — taiga. Local tourism like rafting, horseback riding, mountain and Nordic skiing, hunting, mountain climbing can keep a visitor busy. There are many museums and art galleries in Kemerovo, most of which are located in the city center. Several indoor and outdoor sports arenas are situated there. Kemerovo has the first indoor arena in Russia only used for bandy, which is a popular sport here. The striking feature for the visitor to Tomsk is a number of young people on its streets that gained it a title of students’ city. It is said that every 5th resident is a student. Tomsk State University and Tomsk Polytechnic University are one of the best Russia’s educational establishments secured Tomsk a title of educational center of Siberia. There are a lot of businesses tightly connected with science, IT industry is well developed. 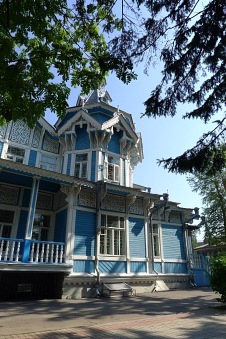 Another distinctive feature of Tomsk is its wooden houses with elaborately carved window patterns bridging the past and present of the city’s history. Like many other Siberian cities it was the place of exile from mid 18th century till Soviet times. The Narym Political Exile Museum keeps the memory of exiles, dating back to the Tsarist regime. The former Soviet leader, Josef Stalin himself was banished to Narym. KGB Memorial Museum, located in the original Tomsk KGB headquarters is the only one like it in the country. It is a reminder of the terror of the regime as many concentration camps were set up in the Tomsk region by the Communists. Despite its cruel history, Tomsk is a very friendly city with the true sprit of Siberia. Its humorous population seems not to be offended much by the writer Anton Chekhov who was unimpressed when he visited Tomsk, and wrote that the men were drunk and the women were ugly. His visit is now commemorated by a statue which shows him from the perspective of a drunk on the pavement, so that his feet appear unnaturally large. Some other Tomsk sites are Resurrection Hill with the 'Golden Gate' wooden tower. It was the site of the original Tomsk fortress on the bank of the Tom River. The fortress was constructed by Cossacks under a decree from Tsar Boris Godunov in 1604. The protected territory later became Russian and the place where the future Tomsk city would be built. Another place to visit is Lagerny Gardens with huge memorial to those who lost their lives in World War II. Tyumen is the capital of one of Russia’s largest region and largest gas and oil-exporting area, is a kind of Siberian business capital. Tyumen was founded as a military settlement, annexed to Russia by the Cossacks in the 16th century. It was an important center of trade between Siberia and China and Central Russia in the 19th century. 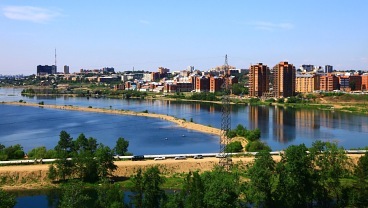 Tyumen underwent rapid industrialization in 1930th and experiences the growth and development during WWII. As in the winter of 1941 twenty-two major industrial enterprises were evacuated to Tyumen from the European part of the Soviet Union. It also became a refuge for the body of the deceased Soviet leader Vladimir Lenin. For this period Mausoleum’s functions were fulfilled by current Tyumensky State Agricultural Academy. Since 1960 when large oil- and gas-fields were explored in the area Tyumen had the next economical and population boom. Today it is called “oil and gas capital” of Russia. 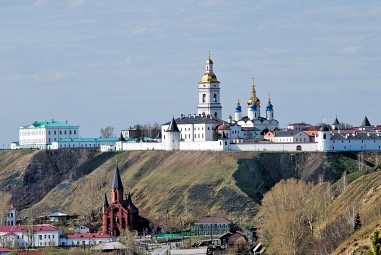 Tobolsk is a historic capital of Siberia and most ancient Siberian city. It was founded by Yermak Timofeyevich's Cossacks in 1585–1586 after the annexation of Siberia to Russia. 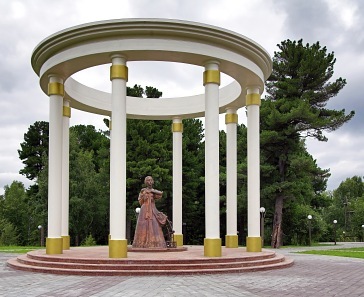 Due to its advantageous strategic location on the Irtysh Tobolsk was the political, military and religious center of Russian Siberia until the 18th century. Tobolsk is especially famous for its unique and the only in Siberia stone Kremlin (end of 17th-beginning of the 18th centuries), the main symbol of Russian royalty remained in the city. Tobolsk is a small city will little less than 100.000 people. It is about 250 (155 miles) km from Tyumen. The city’s three main districts – the historical center that keeps the treasures of the 17th and 18th centuries architecture, the old town with its rural atmosphere and the modern town, whose blockS of apartments are typical to any Russian city - make a unique mixture of different epochs. Tobolsk could be an attractive tourist destination and it does have what to offer to the traveler, however its location just off the Trans-Siberian railroad makes it an underestimated hidden pearl of Siberia.